Our exclusive heavy cast aluminum Bundt Bakeware provides superior baking performance. Baked goods rise evenly, cook uniformly and are finely detailed thanks to the excellent thermal conduction of the heavy walls. A special heat-reflective exterior and premium non-stick surface assures perfect results. Our unique pans are wonderful for bread, moulded desserts and savoury dishes, as well as that special cake recipe of yours! The original Bundt ® design accommodates 9 cup capacity recipes and cake mixes. Handles make lifting and unmoulding a breeze. 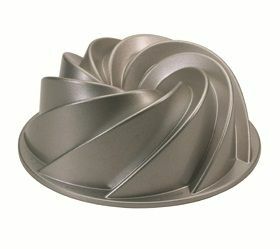 Heritage Bundt Pan Our exclusive heavy cast aluminum Bundt Bakeware provides superior baking performance. Baked goods rise evenly, cook uniformly and are finely detailed thanks to the excellent thermal conduction of the heavy walls. A special heat-reflective exterior and premium non-stick surface assures perfect results. Our unique pans are wonderful for bread, moulded desserts and savoury dishes, as well as that special cake recipe of yours! Heritage Bundt Pan is rated 5.0 out of 5 by 3. Rated 5 out of 5 by Donnna from Great Product I purchased this cake pan online about a month ago..super product..heavy cast iron construction and have make several buntd cakes in it. Rated 5 out of 5 by Peggy from Very well made I have made a few pound cakes in it and not one stuck to the pan. Rated 5 out of 5 by TampaBuyer from Pleased with purchase and ease of ordering As expected (and hoped), I was pleased with my Nordic Ware pan. Great line of cookware. I'd comparison shopped on prices, availability, and Home Depot won by landslide. Had never ordered online via the Home Depot website or had a purchase shipped directly to my local store, so this was something new for me. It couldn't have been easier. Quickly shipped (free), easy to pick up at the Customer Service Desk, etc.... and all at a cheaper price than other businesses. Will gladly do so again. Thanks.